I’ve been a bit of a disaster in the kitchen lately. Last weekend I had a trifecta — my glass blender exploded, breaking into two pieces and spraying hot tomatillo sauce all over my kitchen; I left the oven on all night long (oops); and a defrosting bag of cranberries left a huge red cranberry stain on my granite countertops (managed to get it out, thank you, Google). 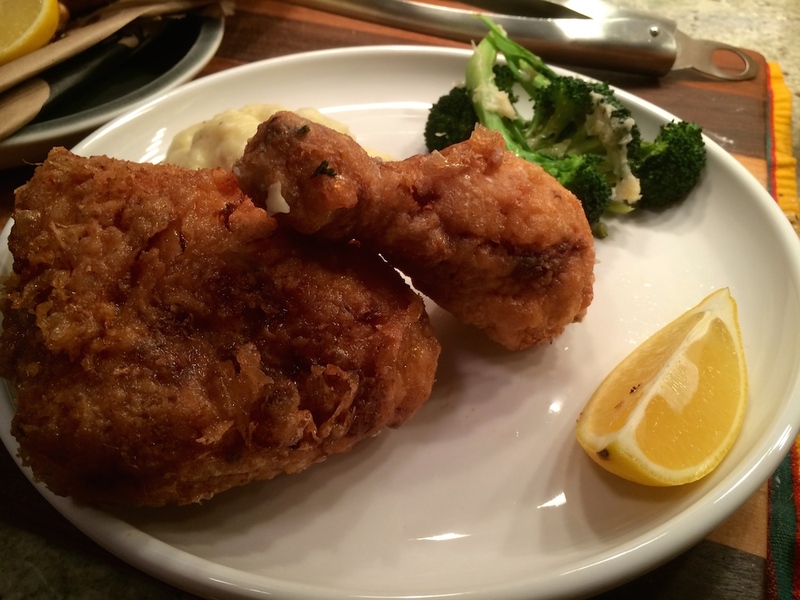 However, this fried chicken was far from a disaster. Oh no. No disaster here. I admit I was a little intimidated. 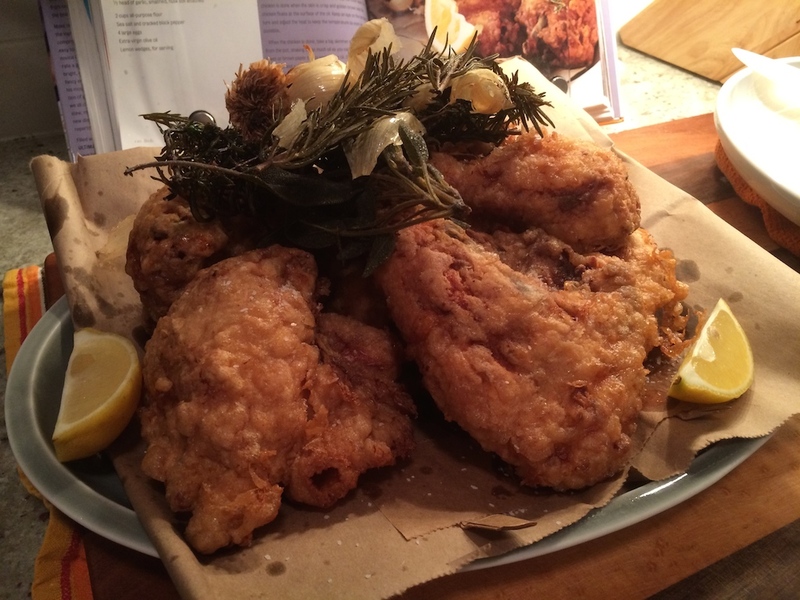 I’ve never cooked fried chicken before, and a lot can go wrong when you heat a big vat of oil to high temperatures. But the challenge was on. I followed a Tyler Florence recipe from his “The Ultimate” cookbook. You marinate the chicken in lemon juice while the oil heats, but otherwise the recipe is pretty simple. It’s your basic flour and egg wash combination. But wow does this make a juicy, delicious chicken. It was perhaps the most flavorful chicken I’ve ever had, inside an amazing, crispy crust that I was licking off my fingers. One great secret — crisping up a combination of herbs and garlic in the oil while it warms up. Rosemary, thyme, sage…then you reserve it and sprinkle that crispy flavor over the chicken when it’s done. So good. With a squeeze of lemon for some acid, alongside some rich mashed potatoes, I was in home-cooking heaven. Trust me, make this chicken. I reheated it the day after in the oven at 350 for about 15 minutes — not quite as crispy as the day before, but still quite delicious. This probably goes without saying, but you must use a skin-on chicken. Non-negotiable. You can save money by buying a whole chicken and breaking it down yourself. It’s actually not that bad if you have a good knife. Google it. I’ve found a quartered chicken at my local grocery store and that’s even easier — you don’t have to deal with the back, etc. I found it hard to find peanut oil, so I used canola. Vegetable would work as well. I also bought a deep fry thermometer, which was worth it. The mashed potatoes call for a ricer to mash them, but I used an immersion blender. An electric mixer or potato masher would work just as well. The broccoli is excellent, but next time I’m going to try to roast it the whole time instead of pre-boiling it. Rinse the chicken pieces and pat dry. Put them in a large bowl and squeeze the lemon juice over them, turning the chicken so that the lemon gets all through it. Let it marinate while you heat the oil. Pour the peanut oil into a large pasta pot. Add the herbs and garlic and heat over medium-high heat until the oil registers 350 degrees on one of those clip-on deep-fry thermometers. The herbs and garlic will perfume the oil with their flavor as the oil comes up to temperature. Meanwhile, put the flour in a large, shallow platter and hit it with a generous seasoning of salt and pepper. Crack the eggs into a large, shallow bowl, add a drizzle of olive oil and a couple of tablespoons of water and whisk it all together with a fork. When the oil reached 350, skim off the herbs and garlic with a slotted spoon; reserve. Roll the chicken pieces around in the flour until well coated. Shake off the excess, then dunk them in the egg wash. Carefully drop the chicken into the hot oil (you can cook it all at the same time) and cook for about 20 minutes, turning it with tongs every now and then to keep the color even. The chicken is done when the skin is crisp and golden brown and the chicken floats at the surface of the oil.. Keep an eye on the temperature and adjust the heat to keep the temperature as even as possible. When the chicken is done, take a big skimmer and remove all of it from the pot, shaking off as much oil as you can, and lay it on a tea towel or brown paper bag to soak up the oil. Sprinkle all over with more salt and a dusting of cracked black pepper. Scatter the reserved herbs and garlic over the top. Serve hot, with big lemon wedges. Put the potatoes in a medium saucepan with cold water to cover. Bring to boil then add 1 teaspoon of salt and reduce the heat and simmer for 15 to 20 minutes, until the potatoes are very tender. Drain. Pass the potatoes through a food mill or a ricer into a large mixing bowl. Stir in the warm cream and butter mixture until the cream is absorbed and the mixture is smooth. Season the potatoes with salt and pepper and finish them off by stirring in 1/4 cup olive oil. Trim about 1 inch off the ends of the broccoli stalks and cut the broccoli lengthwise into spears. Arrange the broccoli on a nonstick cookie sheet, drizzle with some olive oil and season with a little bit of salt and a generous amount of freshly ground black pepper. Toss to coat evenly. Transfer to the oven and roast for 10 minutes. Remove the broccoli from the oven and sprinkle the cheese evenly over the top and bake until the cheese melt and forms a crisp shell over the broccoli, about 10 minutes. Lift the broccoli out onto a platter with a spatula and drizzle with fresh lemon. 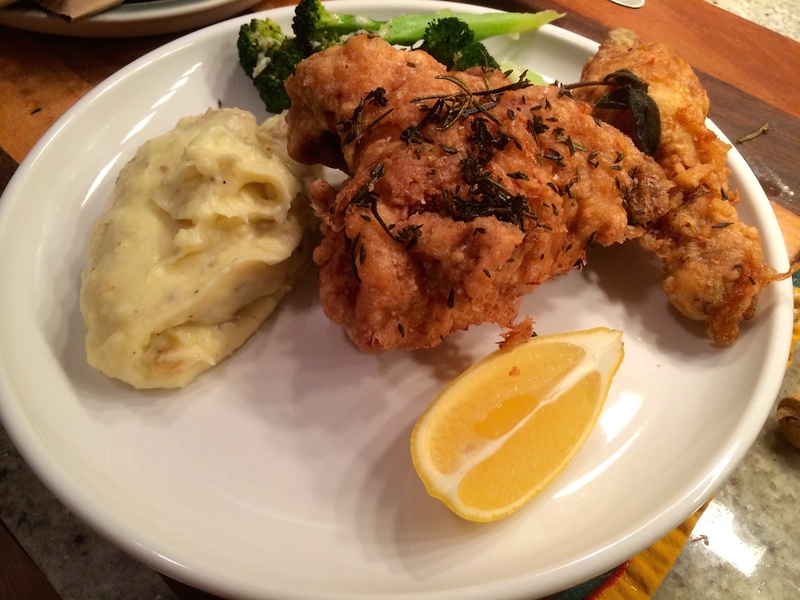 This entry was posted in Recipes and tagged broccoli, fried chicken, mashed potatoes, Tyler Florence by Tricia. Bookmark the permalink.